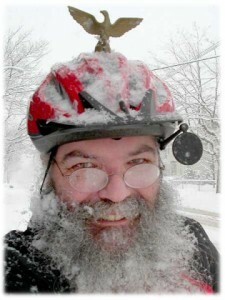 The article covers winter bicycles, clothing, riding technique and choice of routes.There are links to other sites with additional information. Don’t let the cold weather stop you. Getting out and getting exercise is a great way to defeat the winter blues. And you won’t have to dig out the car, or stand shivering at the bus stop. This entry was posted in Updates and tagged bicycle, clothing, cold, fixed, fixed gear, ice, internal-gear, layering, Sheldon, Sheldon Brown, sheldonbrown, sheldonbrown.com, snow, traction, winter. Bookmark the permalink.